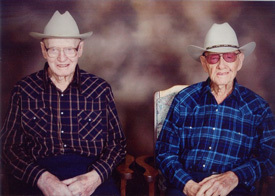 Vern, left, and Tom McDonnell pose in May 2010 portrait before their 100th birthday. (SOUTH DAKOTA) – Brothers Vern and Tom McDonnell chose to quietly celebrate their 101st birthday on May 15, with just family and friends at the Philip Nursing Home. “Tom said that last year pooped him out,” Vern’s daughter-in-law, Terry Jo McDonnell, said of last year’s birthday party at the family ranch north of Quinn (South Dakota). This year’s birthday party, however, was noteworthy for other reasons. The online encyclopedia Wikipedia lists the twins as the oldest living set of male twins and 19th on its list of twins who are older than 100, according to Terry Jo. A doctor and midwife delivered the sons of Frank and Ida McDonnell on the same homestead where they lived until they moved into nursing homes. The brothers grew up together, worked together and lived near each other. Tom claims they never had a disagreement. Both men have outlived their wives. Vern and Beaulah McDonnell had only one child, Steve, who is married to Terry Jo. Tom and his wife, Rose, never had children. Tom quit driving about two years ago, not long before he moved into the nursing home. If it wasn’t for a painful bone spur on his neck, Tom would still be living at home, Terry Jo said. Tom, who uses a wheelchair only to avoid falling, takes regular rides to the country with a nephew to check on the crops and watch farming operations. The sixth largest “French” city is . . . London! A population survey found that there are more French expatriates living in the English capital than in all but five cities in France. The larger French cities by population are Paris (the capital, with 2.3 million people), Marseilles, Lyon, Toulouse and Nice. You can stop smacking the bottom of the bottle. MIT researchers have solved one of the world’s eternal scientific mysteries — how to get out the last drop of ketchup. Their solution is LiquiGlide, a super-slippery coating that won’t let anything stick to the insides of glass and plastic bottles. It uses FDA-approved substances and could save a million tons of wasted food a year, according to the MIT team. Mel and Joey Schwanke have been married for nearly 65 years. And for more than half that time, they have been wearing matching outfits every single day. “We don’t dare go somewhere without having matching outfits,” Mel told Fremont, Neb., affiliate KETV. 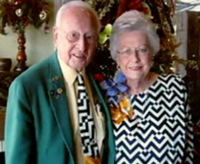 The couple reportedly have 146 custom-made matching outfits, which they’ve been rotating over the course of 35 years. Though to be clear, they don’t actually wear the exact same outfit. The customary arrangement is that Mel will wear a tie to match Joey’s dress. The trend started as part of the couple’s flower shop business, which they operated for more than 60 years. Although they don’t recall exactly what inspired the first matching outfit. “It was before we traveled in ’76, so let’s see …” Joey, 81, said. “Oh goodness sakes, no, I don’t remember how that first outfit came about,” Mel added. But he is sure about one thing, Joey almost always picks out the matching outfit combinations. He doesn’t sit very tall in the saddle, but intrepid Australian toddler Royce Gill is striving to make his mark on the rodeo circuit. Royce, 2, who rides a miniature pony, recently competed in the under-18 division at the Beaudesert Rodeo in barrel racing. The toddler is a proud, seventh-generation cowboy. From The Rapid City Journal (South Dakota), The New York Post and Yahoo News.